New York Giants wide receiver Odell Beckham Jr. is expected to play in tonight's game against division rival Philadelphia despite lingering hamstring issues. There has been some concern this week that the New York Giants could have to face the Philadelphia Eagles without their most dangerous offensive weapon, but it does not appear that Eli Manning has to worry about that. Mark Eckel of NJ.com reports that Odell Beckham Jr. expected to play Monday night despite missing practice all week with a hamstring injury. Beckham is officially listed as questionable, but the only thing likely to keep him out would be a setback during pregame warmups. There has been some speculation that Beckham tweaked his hamstring during this touchdown celebration last week, but the former LSU star claims he felt a “grab” several plays before that. Beckham has a long history with hamstring injuries, and at one point the struggles appeared to cause some friction between him and his teammates during training camp. 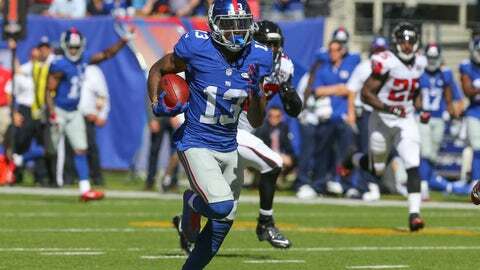 Giants wide receiver Reuben Randle is also listed as questionable with a hamstring injury of his own. It sounds like there is a good chance Manning will have both receivers against Philly, but Beckham is obviously the more critical of the two.